Henri Pescarolo’s team took LMP1 honours in the LMES in 2005, powered by Engine Developments’ GV5, 5 litre V10 engine. The big V10 also powered the two Pescarolo hybrids to dominant front row positions at Le Mans (admittedly with restrictor advantages over the non-hybrid cars) – and very nearly to the race win. 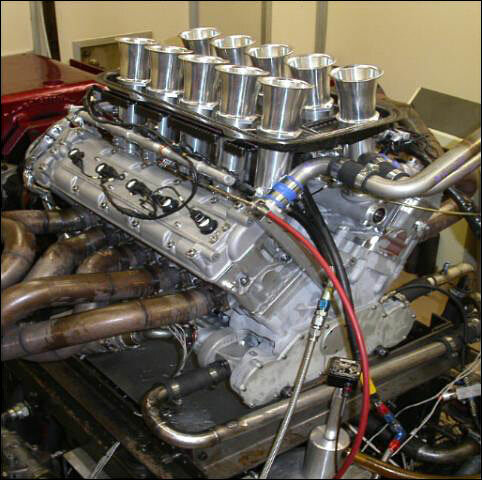 The earliest version of the 5 litre engine was a 24 hour race winner anyway - at Daytona in 2002, in Fredy Lienhard's Dallara (sorry, that was the 4 litre). The engine manufacturer has just announced a significant change to the 5 litre V10, which now becomes the GV5 S2. Here it is on the dyno. The update consists of an entirely new and advanced cylinder head design, which cuts weight at the top end by over 20 kg. The considerable weight saving has been achieved by producing a one piece casting for the entire cylinder head and throttle system and by incorporating some design features from the LMP2 class winning XV V8 engine. The revised V10 has a considerably lower centre of gravity. Pescarolo Sport and Creation Autosportif will use the revised engines in their hybrid cars this year. Engine Developments is also making some significant performance improvements to the XV V8 engine, the LMP2 class winner at Le Mans (in the RML MG Lola EX264). All XV customers will benefit from the changes. The competition in LMP2 gets stronger and stronger.